Foundation of structure and underlying soil are of different physical nature. But when they act together to establish a stability, a combined system is formed and the mechanism of this system involve one entity to influence the performance of other. The final result of this is an interaction between two components. Knowledge about realistic distribution of contact pressure will yield an economical design and soil-structure interaction problems are now an important topic of professional interest and related academic works are conducted about this in foundation engineering. A foundation usually transmit load to soil underneath, a response of which soil will exert a reaction pressure to the foundation at the contact surface between the soil and foundation. Thus foundation is media to transfer load between superstructure and soil. Foundations are designed to distribute load to soil as soil cannot support load of concentrated form (like column or structural wall etc.) as they are arrived from top.This process of load transmission put on soil reaction to foundation i.e. contact pressure. As soil have much lower strength than concrete above, the foundation spreads load to meet bearing, settlement and for other issues. When two components meet to form system, these must satisfy internal stability and external stability. As internal stability, we can include bending moment, shear (both beam shear and punching shear) and rotation of base (torsional rotation) etc. As external stability we can include (though not relevant) sliding, tilting etc. As soil exerts reaction from below and locations of concentrated loads from above are of different nature and intensity, structurally bending is induced on foundation. Thus the foundation need to be designed properly to exert resisting moment to counteract bending moment produced by reaction and structural loading and when this is properly done, the foundation will be capable to transmit loads of superstructure to supporting soil. The total contact pressure can be measured by calculating area of contact pressure on the diagram. The second condition will be satisfied when resultant of contact pressure and that of applied loads are collinear (i.e. there will be no resultant moment). We can calculate average contact pressure depending on the applied load easily. This is a simple case of spread footings. 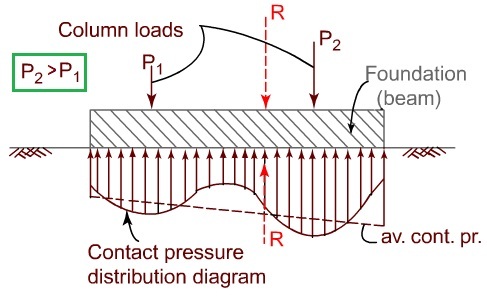 When a foundation supports multiple columns as shown in Fig below, this simple distribution calculated in this way is not the actual distribution of contact pressure. The actual distribution for a particular problem will be the result of soil-foundation interaction. To determine this interaction analysis considering elastic properties of soil and foundation is required. Thus the contact pressure is statically indeterminate. We can only determine average contact pressure based on statics. Contact pressure is determined dividing column loads by area of the contact interface between foundation and soil, if load is concentric. When eccentricity or multiple loads have to considered, the calculation is done based on resultant force including necessary treatment for eccentricity (second portion of right side of above equation). When a foundation is flexible, it will not show any resistance against deflection. It is very easy to realize that it will deflect more near stress concentration. As usually column loads are applied at the center of foundation, it will take a shape of dish, thus a dish shape deformation is observed. Example: earth embankment is considered to have flexible foundation and flexible structure to be supported. When a foundation shows some resistance to deflection, it is called stiff foundation. Being stiff it takes relatively flatter shape but still is in dish-shape. A stiffer foundation thus subjected to relatively smaller differential settlement. Example: A raft foundation supporting whole structure may be treated as stiff foundation. This type of foundation has infinite stiffness which will never deform. Thus a uniform movement is observed, completely omitting differential settlement. Example: a small pad foundation of reinforced concrete having significant thickness. Behavior of stress distribution is different in different types of soil. In case of coarse grained soils individual grains are found somewhat mobile which will result a tendency of soil located near perimeter of foundation to shift outward slightly toward regions of lower stress concentration. On the other hand, in clay soils applied load results to develop shear resistance near the perimeter of foundation which in fact is added to upward reaction. Stiffness of clay soil under footings will be uniform under entire areas of a foundation whereas stiffness of sandy soil increases with the increase in confining pressure. As confining pressure is at the region under center of a foundation, the stiffness will be also greatest at this region. Thus in the regions near periphery of foundation the stiffness will be smaller. Following figure shows contact pressure distribution under a circular raft having point load located at the center; considered raft is supported on incompressible soil like clay provided by Borowicka ( in 1939 which is reviewed by Davis and Poulos, 1974). We can easily interpret that whatever the stiffness of foundation or raft, the contact pressure is not uniform. In case of flexible foundation, a concentration of contact pressure is observed under point load as usual which is found more uniform in case of stiff foundation. The stresses under the edges of rigid foundation are found to increase considerably which is very similar to pressure distribution produced in clay soils under uniform superimposed pressure. Thus it can be said that point load applied at center of rigid foundation can be compared to uniform pressure. The effect of compressibility of foundation soil (i.e. whether it is sand or clay) and stiffness of foundation (i.e. whether it is flexible or rigid) under uniform loading are illustrated in following figure. What is perfectly rigid and perfectly flexible footing? When a foundation can withstand enormous amount of shear force or bending moment with subjecting to negligible deflections, it is called rigid foundation. When capacity of soil is exceeded, the footing settles uniformly i.e. a rigid body movement is occurred. A very thick foundation block is considered to have infinite flexural rigidity, and to have perfect rigidity. A footing can be said as perfectly flexible when it cannot counteract any shear force or bending moment. As this type of footing has very small or no stiffness, it can be subjected to any amount of deflection i.e. 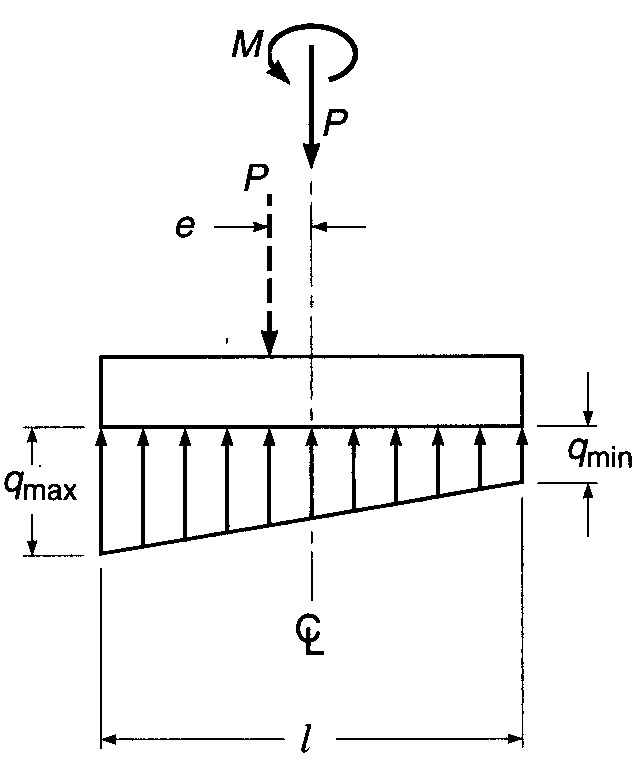 flexural rigidity EI=0. Thus if the foundation has some value of E (+ve), the thickness will be nearly zero; in practical a membrane of very small thickness will represent a perfectly flexible footing. Contact pressure is how soil feels when superimposed load through foundation is applied on it. . For convenience, the contact pressure is assumed to be uniform for all types of footings and all types of soils if load is symmetric. The above assumption of uniform pressure distribution will result in a slightly unsafe design for rigid footing on clays, as the maximum bending moment at center is underestimated. It will give a conservative design for rigid footings on sandy (cohessionless) soils, as the maximum bending moment is overestimated. As contact pressure is an elastic response of soil under applied load, the most accurate and the best approach to determine the distribution and magnitude of contact pressure should be based on theory of elasticity. Still there have other simplified theories like 'Theory of subgrade reaction' which was developed to handle this problem more practically. However, at the ultimate stage just before failure, the soil behaves as an elasto-plastic material ( and not an elastic material) and the contact pressure is uniform and the assumption is justified at the ultimate stage.